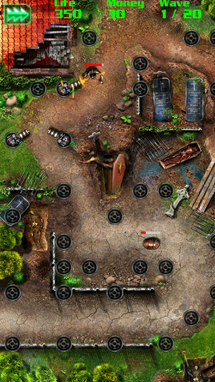 Tower defense (TD) games seem to be plentiful on mobile platforms: their control scheme fits well with a touch surface, they don't require much user input from the player, and don't tend to be graphically intensive. 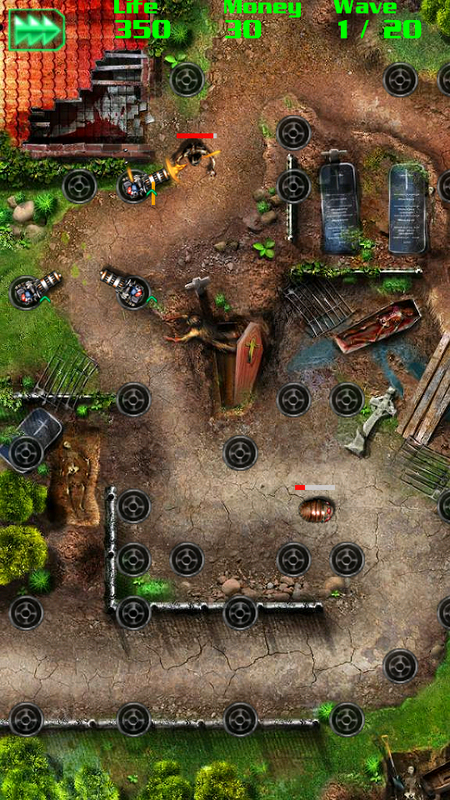 If you're an Android user, you've probably at least tried a TD game before; GRave Defense HD looks to be the one that conquers them all. No, that was not a typo in the title: GRave Defense is really spelled like that. I'm not sure why, to be honest, as there are no drug-addled teenagers waving glowsticks around, nor does pulsing techno music drive the soundtrack. 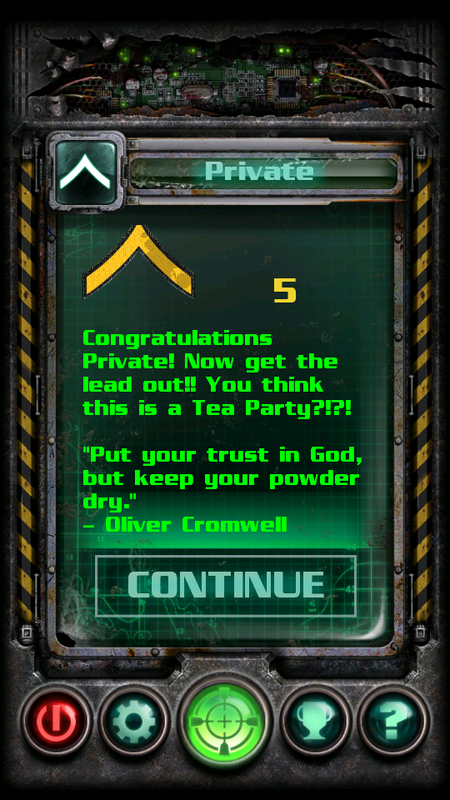 I suppose it's a pun on "Grave Defense," but the "rave" part is clearly emphasized everywhere. Curious. Either way, the game is a graphical update to the standard definition version that's already in the Market. It boasts a number of different levels (all with four levels of difficulty) and a survival mode to keep your appetite whetted for a long while. Replayability has never been an issue with TD games; increase the waves of monsters or increase each monster's individual strength, and you've got a new challenge. Each tower has a number of different qualities, like fire rate and its ability to hit airborne units. This brings variety, but nothing new; you'll find these features in other tower defense games just like it. However, one feature that does seem a bit original is the enemy's ability to take different paths in levels. This adds a bit of unpredictability. The game does outline what path the wave will be taking with a glowing line, but those of us who aren't expecting this multiple-path-mechanic will be left scrambling. That's good. Keeping us on our toes makes us play the game, as opposed to building up a front line of updated guns and then hitting fast forward for the rest of the waves. Guns can be upgraded, which isn't clear at the beginning; throughout my first play-through I was wondering why enemies were still getting by, even though I had every gun position filled. These upgrades are integral to your survival, as they increase the turret's efficiency. Money to upgrade them is earned by killing enemies or picking up money drops, which adds a bit of Plants vs. Zombies to the mix: again, it's encouraging you not to sit back and watch the zombies go by with drops like money, health, explosives or auto-upgrade packages. The main attraction of this game is the fact that the graphics were optimized for powerful devices; we're seeing a lot of games re-tool themselves for "HD" releases now, and GRave Defense is one that makes use of it quite nicely. I really liked how smooth the animations were, which is an important part of a game where there will be a lot of sprites on the screen at once. There was little (if any) slowdown on my Tegra 2 device. 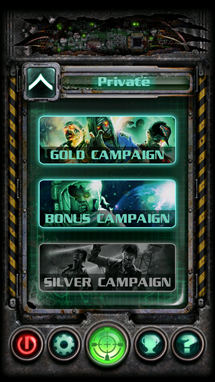 The game features a story-driven main campaign and a bonus space section. These will keep you entertained for a long while, as later-levels are ball-bustingly hard. However, what really gets me about these story sections is how much they feel like B movies. Its writing is atrocious (as you'll see below, it prompts you to "Save the Humanity!") and as far as I can tell, it doesn't seem to be on purpose. Being put into a setting in the not-too-distant future (2050) and saying that we have access to tesla coils and minigun turrets just seems a bit farfetched. Obviously, I'm not asking for realism from a Tower Defense game; just a little bit of creativity when it comes to the setting. With Robo Defense, we're fighting robots with lasers. That seems viable. With a zombie shooter, I'd love to see people with guns as opposed to giant turrets of death. It would make a lot more sense. However, this game just seems to be a mashing-together of everything that people consider "awesome:" tower defense, zombies, aliens, and saving the humanity. If you really want a laugh, go read the enemy descriptions. Seeing Art of Bytes shamelessly rip off "Gollum," complete with references to "my preciousss" is pretty entertaining. All in all, this game is a steal at $0.99 (but that's a temporary deal, so you better grab it while you can). You're going to be getting an absurd amount of mileage from it, which I believe is one of the chief goals of a mobile game. If you can look at the game as a campy B-movie horror flick, bad dialog included, you're going to enjoy it a lot. Amazing high-res graphics! 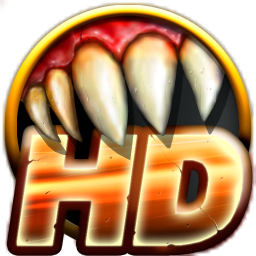 All levels, towers, mutants, special effects and achievements now in HD! NEW achievements, enemies and towers! NEW Military Ranks! 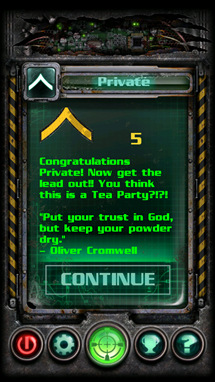 Climb the militant ladder, all the way to the "Top"! NEW improved Survival mode! More upgrades. Scores, achievements, ranks – all online via Scoreloop. Towers change their appearance with upgrades.